While India has transformed itself into a global leader in IT, its major cities have become enclaves for growth that only benefits a middle- and upper-class minority. Despite the increases in employment, this prosperity has not “trickled down” to the millions of impoverished in a highly fragmented, stratified society. The caste system and the history of India’s middle class have engendered political decisions that have not benefited the poor’s use of technology. It is important to examine Indian culture in order to more fully understand reasons behind the duality of a modern, consumerist IT India and a terribly impoverished India. While there are some initiatives underway to address the digital divide, it is challenging to create replicable models in a complex and diverse country that changes rapidly from one location to another. Providing access to technology is not eliminating the existing social, cultural, political and economic factors that have created the inequities. India’s highly skilled middle class, abundance of relatively inexpensive labor, and liberalization of the domestic economy have made it an attractive destination for outsourcing call centers and software development. The industry employs 2 million Indians and is expected to grow over the next few years, renewing hopes for India to evolve into a major economic power. The ability of countries like India to compete in information capitalism has led authors, most notably Thomas Friedman (2005) in his bestseller, The World is Flat, to posit that technology is leveling the global competitive playing field. Neo-liberals view this trend in globalization as a tide that lifts all boats, as free market economics bring prosperity to previously untapped markets. Yet there are estimated to be only 47 million Internet users in India – less than 5% of the population; the average monthly family income of these Internet users is 3.2 times the national average (JuxtConsult, 2009). Most rural Indians have never made a phone call. While English is one of the official languages of India with about 90 million speakers, there are millions more who speak one of the hundreds of other Indian languages that do not have a presence on the English-dominated Internet, and nearly 450 million illiterate adults (UNICEF, 2008). Although India’s economy is growing, there’s a marked disparity in the distribution of wealth and millions are being left behind. Several groups have cited the potential of the Internet for e-governance, local economic regeneration, and mobilizing rural resources for community development (Fukuda-Parr & Birdsall, 2001). This cyber-libertarian approach asserts that access to the Internet will create a more democratic and equitable society. In India, these efforts have most often taken the form of information center kiosks. Studies of these initiatives have indicated that the projects are not delivering what they originally envisioned (Keniston, 2004; Govindan, 2006; Sreekumar, 2006; Thomas, 2006; Tiene, 2002). Providing access to technology is not eliminating the existing social, cultural, political and economic factors that create the inequities. This chapter will highlight the complexity of technology integration in India. The issues of the digital divide go beyond mere connectivity; giving the poor more access to computers will hardly transform such a highly stratified society. The disproportionate access to technology is a symptom, not just a cause, of inequities. While India has transformed itself into a global leader in IT, this prosperity has not “trickled down” to the millions of impoverished due to a number of historical, political, sociological and economic factors. A strong case would need to be made to justify the expense of technology investment for the rural poor in a country that suffers greatly from critical needs in food, health, housing, and basic literacy, and is home to one-third of the world’s poor. 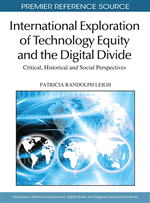 Using social stratification theory, this chapter provides a unique way to understand the digital divide by examining in particular how the caste system and the history of India’s middle class have engendered political decisions that have not benefited the poor’s access to and use of technology, and what efforts are being made to address the digital divide.